You may remember that last year I photographed dozens of rufous hummingbirds feeding on thistle that had come up after the big Tahoe fire. I was wondering if they would return this year along with the thistle. Well they have! What a treat. 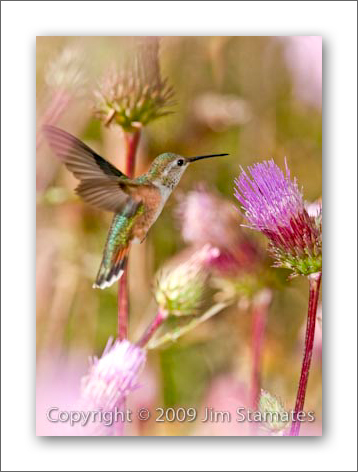 Dozens of little hummingbirds protecting their small territory among the patches of thistle. Lots of other stuff is going on in the burn area; houses being built. the fireweed is in full display, a red-shouldered hawk is working the area, tons of different wildflowers have sprouted up. All in all, a great place to see how nature rebounds. If you want to know exactly where the hummers are, shoot me an email. It is really something to experience. If you would like to attend a “Workshop by the Day” to see and photograph hummingbirds, improve your skills, and learn lots of stuff about photography and nature, let me know.